Before Gary Powell had finished his question about the new Bond movie, I’d already said yes twice. Gary was a 007 veteran. In The World Is Not Enough, he perfected flipping the Q speedboat on the Thames by jumping a smaller vessel—wait for it—onto dry land. He also became inseparable from his T-55 tank in GoldenEye, power-sliding it around the streets of Moscow, through walls and anything else that got in the way. And you should see him drive a car. 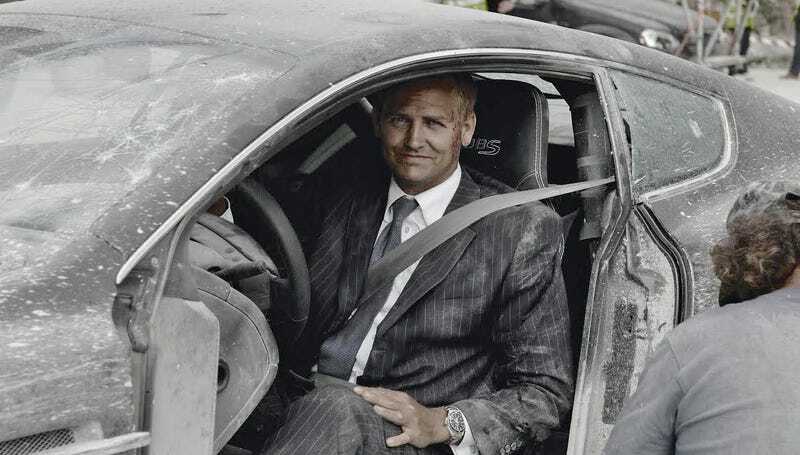 Gary was the stunt coordinator for The Quantum of Solace, which picked up where Casino Royale left off. The script had a dark side to it. Bond’s girl had been murdered at the end of Casino, and Quantum was about revenge. Gary was assembling a team of experts for what was being billed as the biggest opening sequence in Bond film history, with a visceral car chase followed by a bloody rooftop pursuit. The locations, vehicles, and stunt crew were handpicked to guarantee action, and the driving needed to put audiences on the edge of their seats. Which is where I came in. I climbed into a Tom Ford suit that was customized for Daniel Craig and donned the Omega Seamaster watch. I remember thinking that I had a lot to live up to. The first stop was the Riva resort overlooking Lake Garda, itself overshadowed by the imposing and beautiful Dolomite mountains. The stunt team took a guided tour of the Gardesana Road, which rose from Riva and wound its way around the mountainside, punching straight through it in places to form the most spectacular tunnels and galleries that overlooked the restless pool of water below. We entered the mountain and crossed a gingerbread bridge that was wide enough for a horse and cart. It spanned a yawning abyss over a stream that trickled its way down to the lake. The road opened out into a cavern with a low bulging ceiling that could work metal like a pummice stone. Gary’s assistant pointed this out as a potential passing spot. My first call every morning was at 5:45 a.m. with the costume and makeup department for forty-five minutes of hair bashing and metamorphosing. I climbed into a Tom Ford suit that was customized for Daniel Craig and donned the Omega Seamaster watch. I remember thinking that I had a lot to live up to. Awaiting us down on set were no fewer than twelve Aston Martin DBS cars for Bond, worth $240K apiece, as well as six Alfas and a fleet of ND (nondescript) background cars. I gulped down one last espresso: It was time to burn rubber. Gary conducted the “stunties” with the tip of his radio antenna. “Ben, jump in the Aston. We’re doing the high-speed stuff first, so make sure you’re ’appy wiv it.” With that, the DBS became my office. A 200-mph work station. The DBS was one of the most sophisticated machines on the market, perhaps the best front engine sports car ever built. Its graceful curves kept its brute performance covert; beneath the mature exterior was a recalcitrant wild child. It boasted six liters of devilish horsepower, totaling over 500 bhp. The V-12 engine responded to every hint of movement in the throttle, like an F1 car. It howled on full song but quieted to a whispering burble at low revs. The ceramic brakes clamped like vises, but with such sensitivity that you could modulate them at the limit of grip from its fat tires. There was scarcely any visible difference between the DB9 and the DBS, yet the slightly lowered, delicately enhanced suspension turned the girl next door into a supermodel. Beneath her hemline, the heightened technology of the braking and traction control systems was streets ahead. Where most anti-skid systems prevented the tire from getting anywhere near to locking during braking, the Aston’s onboard computer took it to the limit several times a second, and you sensed its work underfoot. I selected the largely unmodified Car 5, running standard tires for maximum grip and outright speed. I climbed aboard and plugged in the crystal key to spark the engine into life. The words power, beauty, soul were thus illuminated on the dashboard. I pulled onto the main road and joined the convoy en route to the first setup of the day. To check that the traction was disabled, I slammed the accelerator and steered right, laying two fat stripes of rubber across the pristine asphalt as I headed toward the Limone tunnel. The Italian polizia in their pretty blue-and-red-striped uniforms tugged at their crotches and cheered. The reverberating drumbeat of the DBS zapping through the wide-columned tunnel was majestic. In order for the near miss to look real, it had to be real. There was no CGI faking the stunts in a Bond movie. We gathered in a turnout overlooking a coiling stretch of road that plunged downward, following the curvature of the mountain. Each Alfa contained a driver and a passenger, and they would be leaning out of their windows to fire automatic weapons in my direction. Jagged rocks bordered the near side, while a thin line of Italian mortar stood between the road and a vertical fall into the bottomless lake on the right. There was no room to deviate either way, no quarter given for error. At a normal driving speed, the curves were sharp enough for the rocky bluffs to block the view of the road ahead. We would be racing at full pelt through a convoy of trucks, box vans, and NDs spread around every turn, while timing our run for a near miss with traffic coming the other way. That meant leaving each move deliberately late, the last thing you would ever do in the real world. Without line of sight, it was challenging to gauge the timing and movement of other vehicles in order to dodge between them and slide into a gap when you needed to. A big dumpster truck would gallop uphill at 50 mph minimum. I would lead the convoy of three Alfas downhill and aim to pass the first box van after the apex of the second bend, then sneak into a space in the traffic as the truck swiped by. As with any passing move, timing was critical. You practice the same thing every day walking past people on the street. They just weigh less. Rounding the second curve too late would mean facing the dumpster truck dead ahead with the box truck blocking my escape to the right. Arriving early rendered the shot useless, and during the timing runs I found my foot creeping onto the accelerator whenever I disappeared behind the coves and lost vision. I had to hold back and count time; then the sequence clicked. Rowley, a seasoned veteran, was behind the wheel of the skip truck, which gave me the confidence to go head-to-head with it, because he would do the same thing every time. But pity the Alfas. They had to find their own space between the traffic. And with them on my tail, I couldn’t just pull the ripcord and jam on the brakes if I mistimed the run without compromising their space. We were in this together. I lined up next to a boulder with a face in it, my start marker, with the Alfas behind. I feathered the Aston away to keep the Alfa group in tow, tight as a trailer. Bond’s previous engagement with a truck earlier in the chase had ripped the door clean off its hinges, leaving me with an al fresco view of the craggy mountainside to our left. We moved down the lakeside at a reasonable speed, and I counted the beats with Gary running a commentary from his cliffside balcony. I lined up behind the first car, jinked left and overtook it, ducked back in behind a van, passed it on the left, and stayed on the wrong side of the road for the agonizing length of time it took to round the blind bluff and start passing the box truck. I cleared its front as the skip truck appeared large as life in my windshield. The top arm snagged the overhanging rocks above the road, shaking the rig and spewing shards of rocks and dust as it bowled toward me. I zapped the throttle and swerved to the right to get out of its way. It passed my driver’s side. With no door to deflect it, the dust from its wheels blew straight into the Aston. I surged down the hill until I was out of shot and then exhaled. Rowley managed to keep his foot hard on the throttle until he passed the Alfas. He was on the mark every time. The constant highs and lows were mentally draining, and we maintained a sense of constant alert. With so many vehicles, it was a case of keeping everyone in the zone. We went over our timings and walked the route over and again. One of the Alfas had spewed oil precisely where I was dodging the truck, so we cleaned it up as best we could and cracked on. The surface change would delay my rate of turn by two seconds, so I factored this in for the next run. I braked a tad earlier, and the Aston slewed predictably across the wet surface in front of the truck, the rear end nipping out of the way as we crossed. It was the kind of high-octane driving I had always wanted to do. Late in the day we were resetting the cars, and I was making a three-point turn under the watchful eye of the first assistant director, Terry Madden. He was effectively the producer’s quarterback. You could be filming a movie about nocturnal animals and his wizened face would still be tanned from the previous shoot. As I nosed up to the cliff edge he sprang into action with a twinkle in his eye. The return up the mountain looked clear to me, and he clocked my expression. It was easy to forget that the return journey, despite being at half pace, bore the closest resemblance to the haphazardness of real life, where there are no practice runs or people with radios to tell you when to abort the run. Passing is probably the riskiest and most complicated maneuver we undertake on the road. Perhaps that’s why your driving instructor never taught you how to do it. As a racing driver, there’s nothing worse than listening to armchair heroes bang on about the lack of passing in a motor race. The last thing any driver wants to do is sit behind a slower car and miss the opportunity to squirt champagne in their eye. However, passing is one area where you may not live to regret a mistake, because once you commit to a move, it can be difficult to unravel yourself when things go pear-shaped. For me the first consideration when assessing a potential pass is: Can I be ‘bothered? If the traffic level is high, then it’s pointless risking life and limb just for the opportunity to read a new license plate number. If the answer to the first question is yes, then I need to come up with a plan that passes muster with the part of me that doesn’t want to become an organ donor. That plan requires having the clear space and enough speed to pull off the move—simple enough, but it’s the detail in arriving at that conclusion that requires your attention. These preliminary checks involve looking near, far, and wide for obvious reasons not to pass.